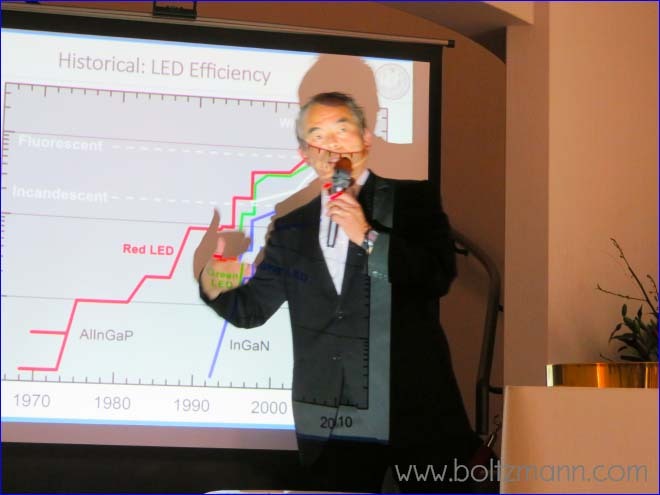 Shuji Nakamura: The invention of high efficiency LEDs and the impact on promoting innovation in Japan, and legal aspects - Ludwig Boltzmann. Measure information. 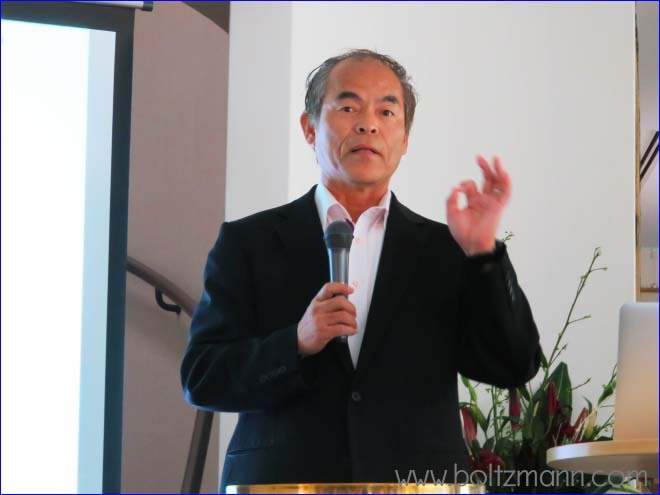 Shuji Nakamura: bottom-up innovation, not top-down innovation. Shuji Nakamura is born on 22 May 1954 in Ohku, part of the village Yotsuhamamura (四ツ浜村, 4290 inhabitants) (日本 愛媛県西宇和郡四ツ浜村大久) on the Western side of Shikoku Island (四国, 4.2 million inhabitants), went to Elementary School and High School in Ozu (大洲), not far away, also on the Western side of Shikoku, studied at Tokushima University, which at that time did not have a Physics Department (Shuji Nakamura later won the Nobel Prize in Physics! 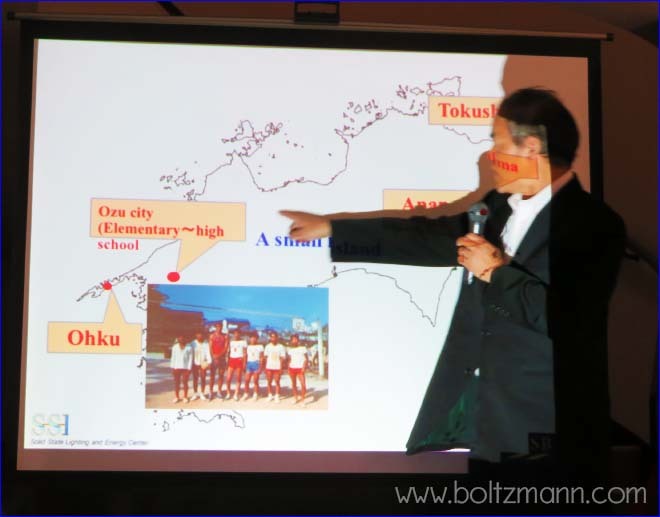 ), and then entered Nichia Chemical Industries in 1979 after graduating from the University of Tokushima. Nichia Chemical Industries is located in Anan, about 20 km south of Tokushima. 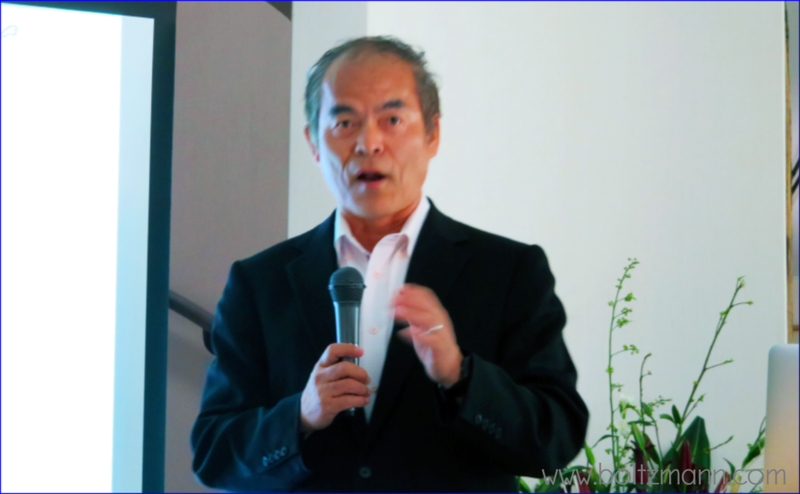 Until moving to the University of California in Santa Barbara, Shuji Nakamura spent his whole life, education, University, and professional work as researcher at Nichia entirely on the Island of Shikoku, with no connection to Tokyo, to Government, or Japan’s establishment, or research establishment. Shuji Nakamura’s lack of connections to Japan’s establishment, industrial establishment, academic establishment or government establishment maybe at the origin of the many misunderstandings which have developed between Shuji Nakamura and Japan’s media, and some of Japan’s establishment. Thus Shuji Nakamura is the perfect example of bottom-up innovation. Not planned from the top. Therefore maybe its hard for people at the top to grasp and accept. Shuji Nakamura and his inventions have huge impact on the world, it is hard for Government and main stream media to accept, that Shuji Nakamura does not fit at all into planned top-down innovation, but has created his own independent path. The contrast between Shuji Nakamura’s bottom-up innovation – recognized and rewarded by the Nobel Prize in Physics – and the official views of top-down innovation seems to have led to many misunderstandings. Shuji Nakamura is making much effort, including today’s talk at the 8th Ludwig Boltzmann Forum, to clear up these misunderstandings. The Royal Swedish Academy of Sciences awarded the Nobel Prize of Physics 2014 to Isamu Akasaki (1/3), Hiroshi Amano (1/3) and Shuji Nakamura (1/3), “for the invention of efficient blue light-emitting diodes which has enabled bright and energy-saving white light sources“. It is perfectly clear from Alfred Nobel’s will, the Nobel Prize Committee awards Nobel Prizes in Physics for “the most important discoveries or inventions within the field of physics” – not for the development of manufacturing technologies. Why is it that Japan’s major Government Organizations and media present a narrative of the LED invention which is opposite to the views of the Nobel Prize Committee and the scientific community outside Japan? Shuji Nakamura expresses his frustration that the clear explanations of the Nobel Prize Committee’s reasons are not understood by Japanese Media, and many others. It appears to Shuji Nakamura that there seems to be a widespread misunderstanding of who invented what, and who was awarded the Nobel Prize for what. Japanese media (Yomiuri Shinbun and others), NHK (e.g. in the Science ZERO program), Japan’s New Energy and Industrial Technology Development Organization NEDO in their publications, Japan’s Science and Technology Agency JST, Japan’s Science Council JSC, Japan’s Ministry of Education, Culture, Sports, Science and Technology, all present a picture of the LED inventions which is opposite to the clear statements by the Nobel Prize Committee. They all write that Professor Akasaka and Amano developed the blue LED in 1989 at Nagoya University, while Shuji Nakamura developed the manufacturing technology in 1993. Such a narrative fits well with a top-down picture, where Professors at Nagoya University make the scientific breakthrough, which is then transferred to industry, where an industrial researcher develops the manufacturing applications, which then the company commercializes. This top-down narrative would fit well the top-down view of innovation, however this is not how the breakthrough invention of GaN LEDs and lasers, which are now leading to the global lighting revolution actually happened. Professors Akasaki and Amano developed methods to produced n-type and p-type GaN and grew homo-junction GaN LEDs, which emit light, but which are highly inefficient, and the light emission is very dim. Still, this discovery was a crucial step forward, and Akasaka and Amano were awarded shares of the Nobel Prize for these important developments. For tunable colors, high output power an efficient device structure, and many other developments were necessary, which Shuji Nakamura achieved. A crucial step forward was the development of heterostructure LEDs, where electrons and holes are confined in quantum wells formed by hetero-junctions, yielding higher efficiencies. Double heterostructures were invented by Z I Alferov and H Kroemer, who were awarded shares of the 2000 Nobel Prize in Physics for these and other inventions. A particularly important discovery by Shuji Nakamura in 1992 was to find out why p-type GaN could not be efficiently produced previous to this invention. Shuji Nakamura found out that previous researchers had all annealed p-type GaN in hydrogen (H+) atmosphere, which passivated the p-GaN, making it useless for electronic devices. Shuji Nakamura invented the method to anneal p-type GaN in a hydrogen-free atmosphere which for the first time allowed the production of proper p-type GaN layers. This in 1994, Shuji Nakamura could report the first high brightness InGaN LEDs for blue emission, S. Nakamura et al, Appl. Phys. Lett. 64, (1994) 1687-1689. Had Shuji Nakamura developed “only” manufacturing techniques, Shuji Nakamura would certainly not have been awarded the Nobel Prize in Physics. Shuji Nakamura was awarded the Nobel Prize in Physics for a long string of discoveries and developments in the field of physics, in addition to developing a wide range of manufacturing technologies as well, such as the two-flow MOCVD equipment. What is an LED? How to produce energy efficient white light? A light emitting diode (LED) produces light of a single color corresponding to the energy difference of electrons and holes recombining across the bandgap in a semiconductor LED device. By choosing different materials, LEDs emitting light of different colors can be produced. To produce white light, the light emitted by several different LEDs of different color can be combined, e.g. blue + yellow, or blue + yellow + red. Another option to produce white light is to coat a blue light emitting LED with phosphor, where the phosphor converts part of the blue light into yellow light. The remaining blue light combined with the yellow light emitted by the phosphor appears white to the human eye. Conventional white LEDs, consisting of blue LEDs covered by phosphor, show strong blue light emission, and disrupt the human circadian cycle and possibly suppresses melatonin (see: Narusawa et al, J. Phys. D: Appl. Phys. 43 (2010) 354002). Most PCs, laptop, smartphone and tablet liquid crystal displays use such white LEDs for the background lighting, cause eye fatigue, and thus filters can be used to cut the blue light. Apple has acknowledged the dangers of strong blue light emission, and has developed methods to reduce blue light emission. The blue “spike” in the white light output from electronic devices can reduced the production of the sleep inducing melatonin hormone, and has been linked to health disorders and even cancer. No perjury in Japan. 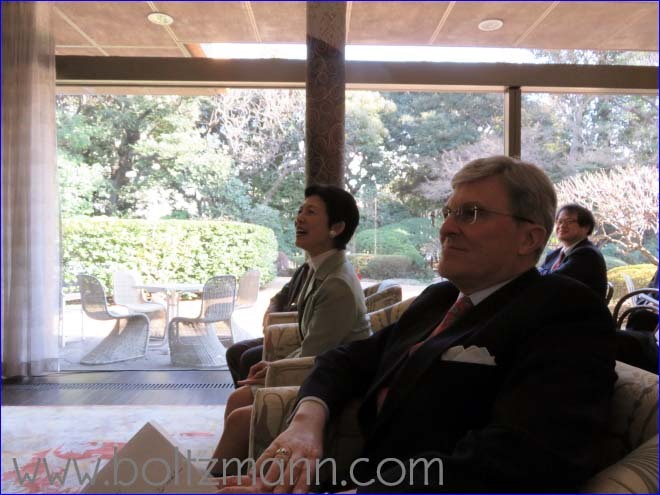 Harder to enforce truth of parties statements in Japan. Libel or defamation are weakly sanctioned, fines/awards are relatively low and on the order of US$ 10,000 in Japan.